A landscape gets a complete look only when it has different elements and features in the right measure. This means, apart from trees and plants, it also needs to have masonry elements like fireplaces, fire pits, retaining walls, paved areas, decorative elements, landscape lighting etc. There is one more addition that creates a stunning look on any property- aquacapes! Adding a water feature to your residential property in Creston, Wadsworth, Strongsville, Medina, Norton and Wooster, is a great way to create drama in the outdoor spaces of your property. We at Stoney Creek Landscaping are experts in the landscaping field and have helped a large number of customers in and around Barberton, Seville, Orville, Brunswick, Cuyahoga Falls and Green, achieve the look they want, on their property. Ponds- These are an excellent addition to any landscaping. The thing to keep in mind here is that these are high maintenance features and if you have a Koi Pond with exotic fish and aquatic plants, you will have to maintain it very well, on a regular basis. 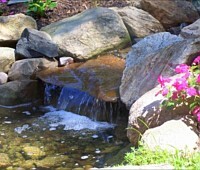 Waterfalls- Many of our customers ask us for waterfall installations on their property. These elements provide an excellent backdrop for many other features in your garden. Rock waterfalls are very popular and they emulate the look of natural waterfalls. If you have kids or pets in the house and are worried about the safety factor, you can opt for pondless waterfalls. These don’t have a pond at base and the water gets drained through cracks in the base and re-circulates in the system. Stone Bubblers- If you have a modestly-sized garden or yard, but still want to add some aquascape element to it, stone bubblers are an excellent addition. These are essentially natural stone boulders that have been cored out and have water running through the holes, which bubbles out and creates a very quaint fountain-like effect. These can also be placed on decks and patios if you like. Statuary Water Fountains- If you prefer more elaborate water features, you can choose to have a statuary water fountain installed. These fountains can be custom designed for you and we can incorporate the decorative elements you need, in these fountains. Regardless of what your requirement is, we are the experts that can provide aquascape design as per your requirements. This helps create a very unique look on your property. We use the best materials, workmanship and installation techniques in our work. We also handle pond pump and pond lights installation as part of the aquascapes project. Adding water features to your landscape is an excellent way to add freshness and create a relaxation zone on your property. For more information, call Stoney Creek Landscaping at 330-466-3181. If you prefer to contact us via email, please send us your queries via this online form. You can also request an estimate via our home page and we will respond shortly.